Squirtle is a Water-type Pokémon and one of the three starting Pokémon in Pokémon Red Version and Pokémon Green Version, later localized as Pokémon Red Version and Pokémon Blue Version. Its name is a portmanteau of "squirt" and "turtle." In the Pokémon series, it evolves into Wartortle and later into Blastoise. In Super Smash Bros. Melee, Squirtle is the first Pokémon to appear on the Poké Floats stage, and it has a trophy. Squirtle is a playable character in Super Smash Bros. Brawl. However, it takes commands from the Pokémon Trainer, who is the real mastermind behind Squirtle's actions. The other two Pokémon used by Pokémon Trainer are Ivysaur and Charizard. When the Pokémon Trainer uses Pokémon Change, his down special move, he returns Squirtle and sends out Ivysaur next, but when used with Charizard, Squirtle is sent out. Squirtle is the lightest of the group, but also attacks the quickest. Squirtle's special moves are derived from Water-type attacks from the Pokémon series. Its standard special move is Water Gun, in which it charges an attack to spit water at opponents. Its side special is Withdraw, which causes it to charge directly ahead in its shell. Its up special is Waterfall, which causes Squirtle to leap into the air on a stream of water. Like all Pokémon of the Pokémon Trainer, Squirtle shares the damage meter with the other Pokémon and has a special stamina stat. It is there to regulate the Pokémon changes. When the player changes Pokémon rarely or too often, the stamina of the Pokémon runs low. Squirtle can also wall jump, and has the ability to stick to walls. Finally, Squirtle has a similar type effectiveness to its games of origin, making it take more damage from grass attacks but less from fire attacks. Squirtle is voiced by Michele Knotz, who also does the voice of the Pokémon Trainer. In the Subspace Emissary, the Pokémon Trainer starts out with only Squirtle. Eventually, he earns Ivysaur and Charizard. Although Squirtle does not return in Super Smash Bros. for Nintendo 3DS and Super Smash Bros. for Wii U, he appears as a trophy in both versions of the game. 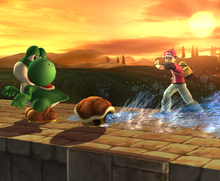 Squirtle returns alongside the Pokémon Trainer, Ivysaur, and Charizard as a playable character in Super Smash Bros. Ultimate, with its appearance updated to match its current design. The stamina mechanic has been removed, so like Ivysaur and Charizard, Squirtle does not tire if in battle for an extended period of time. Squirtle has a new down tilt which only hits once, while its forward smash now has it lash out a stream of water. Squirtle's back aerial is repurposed into a multi-hitting attack, while his standard and forward aerials receive alterations. Water Gun is Squirtle's standard special move. 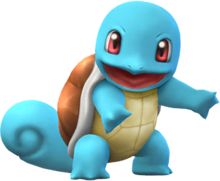 Squirtle charges up the move when first used, and when the special attack button is pressed again Squirtle spits a stream of water from its mouth, the distance determined by how long the move was charged. If used right after charging, the move is instead a close-range attack. 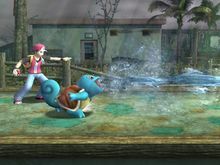 While charging and spitting in mid-air, players can still move Squirtle, and like most charging attacks the charging can be canceled and stored. Withdraw is Squirtle's side special move. Squirtle retreats into its shell and charges forward, spinning around and knocking any opponents into the air similar to a Green Shell. While Squirtle cannot be damaged while using the move, it can be jumped on, causing it to fall onto its back for a time and leaving it helpless. The attack can also be ended if the player holds the control stick in the opposite direction. Squirtle's speed can also be adjusted by rapidly tilting the control stick rather than holding it. In Super Smash Bros. Ultimate, Squirtle immediately exits his shell upon hitting an opponent with this move, preventing it from potentially hitting multiple times. Waterfall is Squirtle's up special move. 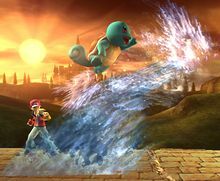 Squirtle travels into the air at an angle on top of a stream of water that damages any opponents in its path, dealing multiple hits. The direction can be altered using the control stick. Pokémon Change is the Pokémon Trainer's down special move shared across all three Pokémon. When used, Ivysaur takes Squirtle's place. Triple Finish is the Pokémon Trainer's Final Smash, in which all three Pokémon join in to attack. During the move, Squirtle uses Hydro Pump. Squirtle appears as an Event Course costume in Super Mario Maker. It can be unlocked by completing the "I Choose You!" Event Course along with Bulbasaur and Charmander, released on February 11, 2016. Unlike the Pokémon costumes already available in the game, Squirtle, Bulbasaur and Charmander use sound effects from the original Pokémon games. GB Pokémon Red/Blue A Tiny Turtle Pokémon. In times of danger, it pulls its arms and legs inside its shell to protect itself from enemy attacks. When it conceals its neck, it also shoots a powerful stream of water from its mouth. Its shell not only protects its body, it also reduces water friction when it's in the water. When it levels up, it evolves into Wartortle. GBA Pokémon FireRed & Pokémon LeafGreen (09/2004) NA: At the start of their Pokémon adventures, many aspiring trainers visit Professor Oak to choose one of three starter Pokémon. Squirtle's always a popular choice, what with it being so gosh-darn adorable. When it's in danger, though, it withdraws into its shell and spits a high-pressure burst of water–a bit less adorable. French Carapuce Carapace (shell) + puce (flea). German Schiggy From "schildkröte" (turtle). Kkobugi Pun of 꼬마 (kkoma, "kid") and 거북이 (geobuk'i, "turtle"). Jiéníguī Partial translation of the Japanese name and possible a pun of 車厘子 (chēlèihji, "cherry"). Partial translation of the Japanese name. The last character in the name mean "turtle". 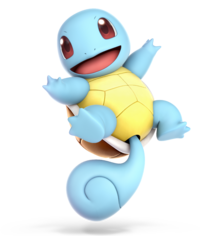 Along with Sheik, Zero Suit Samus, and Sonic the Hedgehog, Squirtle is one of the few characters in the Subspace Emissary not to be seen in trophy form. This page was last edited on March 12, 2019, at 23:39.